A sweet, sensitive romantic comedy, Enough Said seems like the perfect vehicle for Julia Louis-Dreyfus to finally get a shot at big-screen stardom. 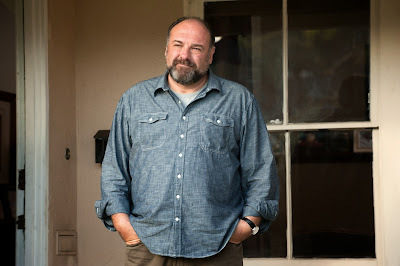 The untimely death of James Gandolfini, whose range was often underutilized, is heartbreaking given how director Nicole Holofcener manages to position this story of two divorcées finding love as a could-have-been potential breakout hit for both TV actors. Because of Gandolfini's passing, a bittersweet pall hangs over Enough Said that sometimes threatens to obscure the inherent gentleness of the film. Ultimately, though, both stars' engaging performances allow the movie to transcend whatever preconceived notions, real-world or otherwise, we attach to them. Enough Said taps into a largely unseen reserve of tentativeness in Louis-Dreyfus. As Seinfeld's Elaine, and the titular characters on The New Adventures of Old Christine and Veep, her brand of comedy builds on the fact that this somewhat relatable actress has a fatal flaw, blundering into situations without thinking of the consequences. In Enough Said, we get the opposite, a woman who still shows a glimmer of that carefree quality but has had it beat out of her by life and bad choices in love. What enlivens this comedy is the tension created by Louis-Dreyfus's popular persona and the natural trepidation Eva, the masseuse she portrays in Enough Said, feels as she dives deep into a new relationship with Gandolfini's Albert. That's not to say Eva doesn't still find a way to blunder into a TV-comedy-like situation. At the same party where she first meets Albert she is introduced to Marianne (Catherine Keener), a new-agey poet who is both a potential client and friend for Eva. As they grow closer, she starts to realize that the ex-husband Marianne is always disparaging is actually Albert. 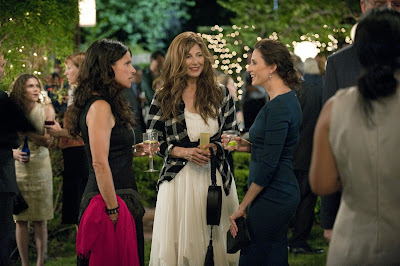 Eva falls into the trap of using Marianne as a "human Trip Advisor," a means of protecting herself from getting too involved with her new man that inadvertently begins to poison their relationship. This culminates in a tipsy Eva nitpicking all of Albert's annoying habits—from the way he dips into his guacamole to his inability to whisper—at a dinner party meant to introduce him to her friends Sarah (Toni Collette) and Will (Ben Falcone). To Holofcener's credit, the inevitable discovery by Albert and Marianne that Eva knows both of them is executed in as realistic and un-sitcom-y a manner as one could conceive. Enough Said is really about how time eventually takes a toll on all kinds of relationships, even ones that begin as the most manic of crushes the way Eva's does with Albert. So it really makes sense that it is Gandolfini who is the most diverting. Here is a charismatic man who terrifyingly managed to hold our collective attention for years as the head of a Mafia family on The Sopranos. Yet all of his flaws are quite immediately obvious—his girth, his hirsuteness, his baldness, his nasal vocal quality—all of which get some play in Enough Said. Gandolfini personifies the kind of man a woman might awkwardly fall for and start growing tired of over time. But to those who have seen Gandolfini play Tony Soprano, a corrupt man at his worst, Albert is the sharpest of contrasts, a decent man at his best. Holofcener wants us to root for Albert, for Eva to learn that a long-lasting relationship is not one where you try to change bad habits or belittle someone for them. It's a theme that resonates throughout Enough Said in the way that Sarah and Will deal with their maid who constantly misplaces items in inappropriate spots (a hairbrush in the silverware drawer) and in the depiction of the self-actualized Marianne, who is exacting and demanding to the point of friendlessness. The longest lasting relationships, Enough Said says, are the ones in which you put up with another person's failings and learn to look past them. After watching him in this, I'm sad we won't be seeing Gandolfini mining his own imperfections anymore.